Having an event? Then why not book one of our rooms! 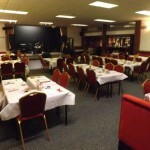 Our large Concert & Function Room has a stage and a dance floor area, plus its own separate bar located within the room so your event can be kept totally private. It holds up to 150 people in the carpeted seating area, with the dance floor kept clear for dancing. Maximum capacity is 200. 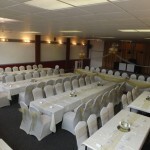 Ideal if you are planning a Wedding, Christening, or just want to throw a party, this room is available for hire from £60 per event. The concert hall is also ideal for band practices, dance classes, fitness classes and similar events. Call us now to find out pricing & availability on 01455 272300. Large Car Park at Rear. 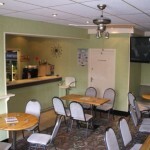 We also have a smaller Lounge for hire for the more intimate event. Again, the lou nge has its own separate bar to ensure your privacy. 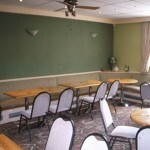 This cosy room holds up to 50 people and is very modestly priced. Call 01455 272300 for further details. Ample on-site car parking available.